MARSHALL:	Smith. What other name do you have? MARSHALL:	Maxine? Ometha Maxine or Maxine Ometha? MARSHALL:	Smith. Okay. You were born in Ypsilanti. SMITH:	No. I was born in Oklahoma. MARSHALL:	Oh, you were born in Oklahoma—I see, I see. I knew your father had been from Oklahoma but I didn't know whether he had come here directly after school. When your father came to Ypsilanti; do you know when he came? SMITH:	Yes, ah, it was around ’32. MARSHALL:	Spencer Washington. And you came here around 1932. SMITH:	No, I came in ’37. MARSHALL:	You came in ’37, he came in ’32. MARSHALL:	Okay. And, uh, did he come here to teach? SMITH:	No, he came here to go to the University of Michigan. SMITH:	Um, he, uh, got his master’s from Michigan in ’34, I believe it was. SMITH:	No, surprisingly, he never taught. MARSHALL:	Oh, didn’t he? Somehow I had the feeling that he’d taught at least once. SMITH:	Well, in, in Oklahoma, ah, but after he came here he was working at Ford’s. SMITH:	ah, in the elec—as an electrician. Ah, and in ’36 he started working with the CCCs. SMITH:	in, at that time, because he was call—what they call the educational advisor, and of course he left Ypsilanti at that time. MARSHALL:	Oh. Uh, how many children, how many, how many children did, uh, did, well, they—how many siblings? MARSHALL:	And the half-sister, right. SMITH:	That’s—oh, and I have a brother who’s dead. MARSHALL:	James, right, mm-hmm. Now [you…] Well, uh, uh, then, then of course, uh, uh, you came here in 1937, did you go, when you went to Lincoln, did you go from here or did you go from Oklahoma? SMITH:	No, I’m sorr—yeah, I came to Michigan in ’37 but I didn’t live here. SMITH:	and I lived up there. SMITH:	I really did not, ah, although our home base was Ypsilanti, I really did not live in Ypsilanti, until ’41. MARSHALL:	Oh. When’d you go to Wayne? MARSHALL:	Before the war. That’s, that’s the way we missed you. I believe 3:00we, I believe you said that earlier. That was where we missed you. Ruthe and I married in June of ’41 and September of ’41 we went to Winston-Salem. SMITH:	Uh, that’s, that’s when I went, that’s when I went. MARSHALL:	Ah, then, ah, now I guess, uh, one of the things I’ve been trying to restructure, and if I can use your memory to some extent on that, I’m trying to re—to restructure your father’s work in Ypsilanti. Now, somehow I picked up, picked up an idea that once he had a store. MARSHALL:	Where was his store? SMITH:	The store was on the corner of Harriet and Hamilton. MARSHALL:	Harriet and Hamilton. What kind of store was it? SMITH:	matter of fact he had two cafes. SMITH:	Post. Over on Wharton Street. Post 4-0-8? MARSHALL:	Oh oh oh oh yeah, Whar—yeah, Wharton, mm-hmm. SMITH:	at that time, ah, so, uh, Daddy ran, he was working for the Housing Commission, but he also ran this cafeteria at the post, that’s what it was really built for, was a cafeteria. Ah, and they also then we had a cafe at the corner of Harriet and Hamilton, and then after the war, and because it was too much for him, we closed the store and then we had a grocery store, next door, when we closed the cafe we had a grocery store, uh, on the other side, ah, and then the, the old cafe became a cleaner’s. MARSHALL:	Oh. Who ran it then? MARSHALL:	That’s a new one on me, I didn’t know about that. I did, I did a, a talk yesterday on Afro-American entrepreneurs. And I covered lot of people but I didn’t know about that cleaner’s. SMITH:	Uh-huh, yeah, and that—then, then there was a Mrs. Mertice Stinson. She may have first ran the cafe after Daddy uh, closed it, um, y’know, Mrs. Stinson did. You know Benny Edwards? Well, it was her mother. MARSHALL:	Well, anyway, then he did run that business. Now um, at that time, and of course, uh, after, after leaving the business, was it after leaving the business that he ran for public office? SMITH:	because I think he ran for election and he succeeded. MARSHALL:	Mm-hmm, mm-hmm. And then I understand that he, how many terms did he serve? SMITH:	I, I’m not too sure of, of that, uh, I would, I would say at least four or five years that, that he was on the council, but I’m really not, not sure. MARSHALL:	Okay. Well, then he was—as I understand, he withdrew from the city council in order to accept the position as Housing Director? SMITH:	Now, that would have been, um, in the late 40s. MARSHALL:	Mm-hmm, mm-hmm. And then and then was it while he was Housing Director that he became a member of the Board of Education, or was that after that? SMITH:	Ah, no, that was while he was Housing Director. He remained Housing Director until the time he died. MARSHALL:	Oh, yeah, okay. But then he, he was on the Board of Education in the ’50s. SMITH:	on the Board of Education. MARSHALL:	Mm-hmm. Well, Dr. Perry, yeah, Dr. Perry, I have that Dr. Perry was on the board before that time. Well, that’s interesting. Um, the way I remember some of this, is, is, I was working with the alumni, and I remember getting the sheet back from him in which he was on the Board of Education, and that was in the ’50s. And I didn’t start until 1950s. MARSHALL:	[Laughs] I was reading my news. And even though I never met your father personally, I knew about him, becau—you know, through the alumni thing. Well, anyway, um, uh, uh, do you remember, what, when did he die, what year did he die? MARSHALL:	’67. Then, then you, uh, of course, through your, through your father then you were here doing very, a, a period of active, uh, I guess progress, and black participation in the community. SMITH:	I only lived in Ypsilanti from ’43 to ’46. MARSHALL:	Yeah? When did you come back? MARSHALL:	Well, that’s period, what, what did you call that period? SMITH:	Ah, well, I came back in 1960. MARSHALL:	Do you know when I came here in ’60 I couldn’t find a real estate man to show me a house? Including Francois? SMITH:	I, I don’t think real estate has been one of our strong points. MARSHALL:	No. I found that there was a, the first real estate man, well, the first real estate man of course was here back in 1880, found a real estate man listed 1883, that was John Fox. But I don’t find any after John Fox died, and John Fox died at age 32, and I haven’t yet found out what, why he died or anything like that. But then the next one I found was a guy by the name of Richardson? In the ’30s. MARSHALL:	Yeah. And that was in the ’30s, and that was even before Francois. MARSHALL:	And then, uh, of course, uh, might have been more, but those are the ones that stand out in my mind, and then there was not really an important 10:00entity in, in, in, in real estate until our time, until really today, since the time when I’ve been here. MARSHALL:	So it went on, between two and three. SMITH:	Yeah, it’s, it’s, it’s, it’s, it’s, very small. SMITH:	Uh, at that time, you could not eat downtown. MARSHALL:	You know that’s a matter of debate, don’t you? MARSHALL:	Because I talk to some people who say they always ate downtown. SMITH:	But you, eh, let’s put it that you were not welcome. MARSHALL:	Yeah, yeah. Well, that’s the reason I said not welcome. Uh, I, I have talked with some people who have said they, even in the ’30s in high school that they ate down, ate, ate downtown. And this is interesting. But, uh, I have sort of uh, decided that it d—depend on who you were. SMITH:	It did. Uh, I can’t, I, I am not certain it is a fact but I think I can remember some sit-ins downtown. MARSHALL:	Yeah, yeah. I was just wondering about that. SMITH:	Yeah. I, I think there were some. MARSHALL:	Mm-hmm. Now, you, we, another, another angle that we were interested in also is this matter of employment. Now, you came, you came back here in ’60. And, uh, that wa—employment of course was a part of this overall drive 13:00that black people were making. What was the situation with employment in Ypsilanti? Now, I know that you go to work for Ford and General Motors, what were other employment? SMITH:	ah, at that time, ah, but I wasn’t interested. MARSHALL:	Well, school system of course had opened up before anything else. MARSHALL:	What about other things? Uh, what about banks? SMITH:	As, as far as I know at that time there were no openings. Um, I, I would say it was well into the ’70s before any blacks got into the banks. Uh, and I know of no other management-type of, uh, situations that they were in, either. MARSHALL:	What do you, what do you, what do you, what do you hold responsible for that? SMITH:	[Sighs] Well, I have a twofold policy, uh, I don’t know if it’s 14:00twofold, but anyway. I, in the back of my mind, I feel that opportunities in Ypsilanti were missed by blacks because of lack of preparedness. I, I’m not sure that I would always lay it to prejudice. I would say that we were not prepared, and I, I, I maintain this very strongly, it’s my feeling. We do not have the background or the education to go into these fields when the opportunity does present itself, which resemble like, like me managing this project. Um, I got that job because I knew two years before the job was coming up so I prepared myself. MARSHALL:	Yeah, right, mm-hmm. That that, there, there is a kind of a, y-y—one word I think you overlooked, and, and I was thinking along with you, I’d say inclination, too. MARSHALL:	Uh, we don’t seem to be inclined to try to look towards the future, and that’s really what you were saying. We don’t te—seem to be able to look to the future to see what’s going to happen, and to be prepared. But we always coming up at the rear, coming up in the rear, and after it comes and then we’re ready to go out and say, “Well, they won’t let me do this, or they won’t let me do that.” But, one, one case in point on that is, I can’t, can’t recall the woman’s name, [is a woman], but there is a woman that’s at the savings bank, who was there when I got here, do you know who I’m talking about? And she’s still there, and she has a very important position there. MARSHALL:	I should have remembered her name. She is a member of the Business and Professional League. MARSHALL:	And, uh, I met her, ’course I met her through that, but then, and hearing people talk about her, I understand that she’s been at that savings 16:00bank for some years. MARSHALL:	I believe it is. MARSHALL:	Or maybe just Max something. SMITH:	Yeah, uh, I know who you’re talking about. MARSHALL:	and that is whether you would call certain people when they wanted to hire somebody. MARSHALL:	and asked [the senders] if he wanted to hire blacks. MARSHALL:	And of course, I got in touch with Gene Beatty. MARSHALL:	And we sent him one. MARSHALL:	[Laughs] But that’s the way they used to do it in the old days. SMITH:	Yeah, it was depending on who you knew. MARSHALL:	I don’t know if he’s still out there or not. SMITH:	This is hard to believe but I think um, I was, uh, close to the first or 18:00second black to graduate from Eastern that lived in this area. SMITH:	Yeah. And, and, uh, and, and married Clay, but before that time, there, they, they, they just didn’t go. I don’t know why. They, many, many of them went to Cleary. MARSHALL:	to teach, then there wasn’t no point in finishing. So, she still lives here, by the way, and she goes to our church. I’m not going to tell you her name, ’cause, ’cause I haven’t had a chance to run that down yet. SMITH:	I, I’m, I, I, I often wondered about that. MARSHALL:	Uh-huh. Well, now there were some that finished, at least, but now I can’t, I can’t, I, I, you left room for that, you said they weren’t, they are not Ypsilanti people. And she’s the only one from Ypsilanti that I know that finished there. MARSHALL:	that bunch of people. Neil Block. George Goodman. So, what I know, I 20:00know, uh, I, I guess the, guess Eastern’s, Eastern’s tuition was $33 a semester, but it was still a hotbed of prejudice. SMITH:	and I did not bother sending an application to the school of library science. I walked in and at that time the librarian’s name was Miss Andrews, 21:00and I walked in and I announced the classes that I was going to take. SMITH:	there I was. Um, at that time there were lots of people from, from other cities and places that came to Eastern but I presume like any place else at that time, there were prejudice. MARSHALL:	Mm. Now what year, what year was that? SMITH:	I, eh, I, I, um, I, I, came, um, in ’44, let’s see, ’44 through ’46 I was at Eastern. SMITH:	At that time Michigan State Normal College. MARSHALL:	Yeah. Uh-huh, uh-huh. Well, uh, I guess what I was doing was echoing, 22:00I, I, I guess, the echoing that I was giving was a reflection of what some people have felt, even though they may not have been in a position to know. SMITH:	but if, if you, to my idea, if, if, if you don’t go in worrying about 23:00who’s going to be prejudiced I don’t think you’ll find that it’s there. SMITH:	Now maybe one thing about it was in most of the classes that I took, uh, except something like government or, or, or literature class, I was the only black in it, so they didn’t have to worry about me. MARSHALL:	Yeah, yeah, yeah. Were there, why did you get out of the library area? SMITH:	[Sighs] Well, in Detroit, in the late ’60s, in the early ’70s, the school system underwent a radical change. At that time, discipline uh, was almost non-existent. Uh, and it became such a, a mental uh, state for me that I 24:00dreaded going to work. And as I say at that time, since ’55 I had been, um, involved in real estate and, um, I, when I moved to Ypsi I got my broker’s license, at that time I thought I would get filthy rich under the urban renewal program. And Mrs. [Dorothy] sued the city and knocked that out. Ah, so I continued to teach. And then, when, um, when I knew that there was a, a housing complex going to be built I uh, took steps to get out of the teaching field and do something else. SMITH:	And fortunately, um, I, I figured that with a guaranteed salary plus 25:00anything I might make in real estate, it would compensate me, and that’s how I got here [laughs]. MARSHALL:	[Laughs] Well, I think that’s, that’s good thinking, definitely good thinking. Were you, uh, you, you said you’re a member of some of the [city uns]. SMITH:	No, I was not. MARSHALL:	Were you ever involved in any of the political machinations [that is to say] in the, in the election of, uh, of any of these people we’re talking about? SMITH:	No, as I say, um, I wasn’t here. MARSHALL:	No, I’m talking about the ’60s, now. MARSHALL:	[no ma’am, in] the ’60s was when you elected your first mayor. MARSHALL:	Now I think, why, see, in ’67 when John Burton was elected mayor, that’s the first black mayor in the state of Michigan. SMITH:	Yes, he held a unique position, I think there were only about two or 26:00three in the country at that time. MARSHALL:	Well, of, of, of, of, of white, uh, of, of predominately white towns. MARSHALL:	There always traditionally have been black mayors. Uh, now we have a book, we have a book that came out on several years ago on black mayors, and in there you get some who’ve been, who black, some black mayors going back into the early 1900s. But predominately, they came in the ’60s, ’60s, uh, particularly. But he was the first in Michigan, not the first in the United States, in a, in a similar situation. Um, well, I guess the, the, the, um, thing, that I want to get at is how you view this changing scene, for example, 27:00the talk I gave yesterday had to do with entreper—entrepreneurship among Afro-Americans and after giving a, a trace of its, uh, development in the city, uh, the first being in 1838 and that was a barber shop and, of course, ending with uh, ending with Johnny Barfield and Williams and a few other people who are currently in business downtown. What do you see as the possibilities for blacks in this area? SMITH:	I think the sky is the limit. I am not real optimistic unless the average young man changes. MARSHALL:	Well, yeah, I guess that, I would say the same thing all over [laughs]. SMITH:	I wish I knew, because my son is in the same boat. MARSHALL:	Well, you don’t seem to have any trouble, your daughter seems to have a lot of drive. SMITH:	I told you I wasn’t worried of black, black women. I don’t understand it. And, and, and almost every young man that I run into I try to talk to him about preparing himself for anything, and it, those I know that go to Washtenaw, it take them six years to do two years of work and when they get through, they’re not prepared to do anything, unless there’s something I don't know about. MARSHALL:	what’s, what, what, what, what there, what is there, what, what 31:00causes it, what is there that seemingly in some families there seems to be an orientation towards preparation towards success and in other families it, it seems to be the dead end. SMITH:	Mm-hmm. I don’t know the answer, because if anybody had told me that 32:00my son would not have graduated from college I would have told them they were crazy. SMITH:	He went to Clark. MARSHALL:	What does he do now? SMITH:	He is a car salesman for Ann Arbor Volvo. SMITH:	He’s doing very nicely. MARSHALL:	Perhaps that’s part of, part of, part of what the, what the problem is. MARSHALL:	Well, I mean, the problem insofar as doing what you want him to do. MARSHALL:	now in your case you had a father who had, but in my case, my mother 35:00had a third-grade education. All she could say is “I want you to do better than me,” but she couldn’t tell me how to do it. SMITH:	I know what you mean. MARSHALL:	And especially if you look around at some, some, some of my friends, see, I got a friend in Brown Chapel for example, who, whose, why, she has three years of college. Her husband works at Ford and he can hardly write his name, 36:00but he makes a lot more money than she makes. SMITH:	I know. My d—my sister makes more money than I make. MARSHALL:	Okay. Well, look at the, then look at the, look at how the child looks at that. Do you see my point? I mean, unless he happens to be somebody who is basically lazy, and figures, well, I’m not going to go out and do all that hard work, or, he looks at it and say, well, I’ve got my goals set on being an engineer or something like that, and he goes for that because he knows that’s going to be satisfying if it’s just a matter of how much money am I going to work, make in my life, and I’m having a lot of fun now, and should I forego having my fun, and all this, without leaving my friends and then they end up staying where they are, but it doesn’t mean the same to him as it would have meant to me. SMITH:	I don’t believe anything is stopping anyone from being anything in Ypsilanti. MARSHALL:	Do you by, by any chance do you know this Williams guy that, uh, sells cars? SMITH:	Yes, I know John. MARSHALL:	Johnny. Is Johnny a college graduate, or high school? SMITH:	No. He, he’s, uh, I’m not even sure I think he did, but I’m not even sure that he graduated from high school. MARSHALL:	He said he graduated from high school. SMITH:	Well, well, he possibly did, but I think as soon as you know, he was from a, a large family and very poor, and the father died and was ill for a long time, his father was ill for a long time. SMITH:	uh, and has done very well. SMITH:	So they, they saw real hard times. MARSHALL: Smith. What other name do you have? MARSHALL: Maxine? Ometha Maxine or Maxine Ometha? Segment Synopsis: Mrs. Smith answers the questions of A.P. Marshall about her father, Ypsilanti political leader and businessman Amos Washington. The two discuss the early years of Amos Washington's life in Michigan after coming here from Oklahoma during the years of the Great Migration. Subjects: African American families. African American business enterprises. African Americans--Politics and government. 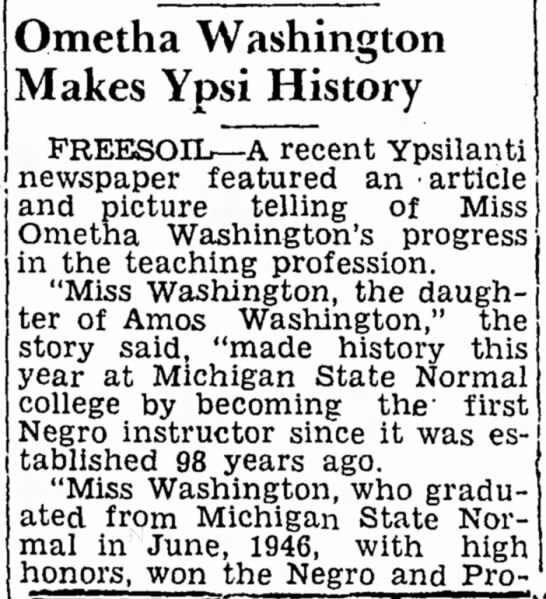 Hyperlink: August 1, 1947 article on Ometha's enrollment and what is now Eastern Michigan University. Partial Transcript: MARSHALL: ’67. Then, then you, uh, of course, through your, through your father then you were here doing very, a, a period of active, uh, I guess progress, and black participation in the community. 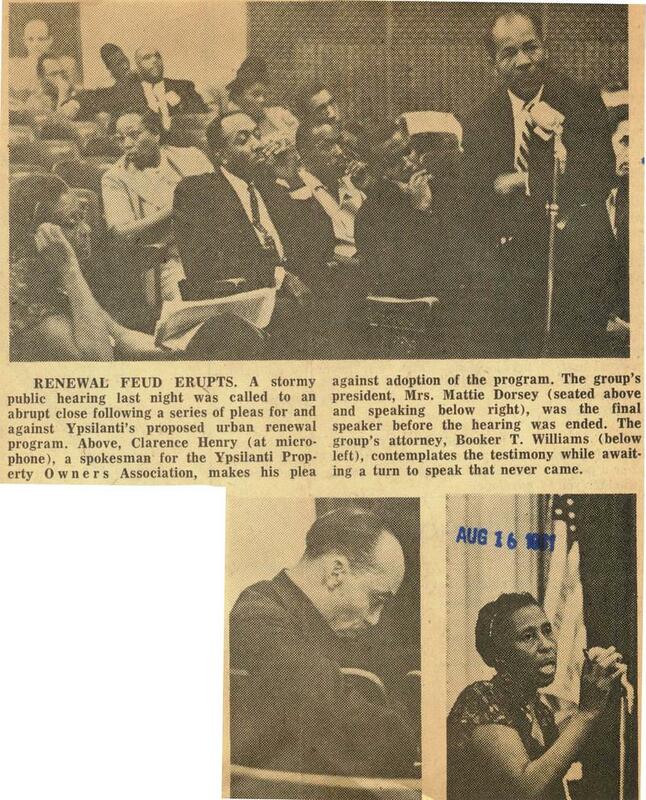 Segment Synopsis: Mr. Marshall and Ometha M. Smith discuss her thoughts on segregation in Ypsilanti, the difficulty in getting housing and the racial atmosphere of the city in the post-Civil Rights era. Subjects: Segregation--Michigan--Ypsilanti--History. Discrimination in housing. African Americans--Employment. Hyperlink: April 24, 1956 Ann Arbor News article on Amos Washington. Segment Synopsis: Mrs. Smith discusses her education and getting a job with the Detroit Public Schools. She discusses returning to Ypsilanti to get her real estate license to take advantage of the Urban Renewal Program proposed for the city. Subjects: Eastern Michigan University. Library science. African Americans--Politics and government. Hyperlink: 1961 Ann Arbor News article on the debate over Urban Renewal in Ypsilanti. Partial Transcript: MARSHALL: Um, well, I guess the, the, the, um, thing, that I want to get at is how you view this changing scene, for example, the talk I gave yesterday had to do with entreper—entrepreneurship among Afro-Americans and after giving a, a trace of its, uh, development in the city, uh, the first being in 1838 and that was a barber shop and, of course, ending with uh, ending with Johnny Barfield and Williams and a few other people who are currently in business downtown. What do you see as the possibilities for blacks in this area? SMITH: I think the sky is the limit. I am not real optimistic unless the average young man changes. Segment Synopsis: Mr. Marshall and Mrs. Smith discusses the future of Black Ypsilanti and their opinion on the need for young people to take advantage of opportunities by acquiring the skills to necessary for upward mobility. Subjects: Intergenerational relations. African American families. African Americans--Employment.